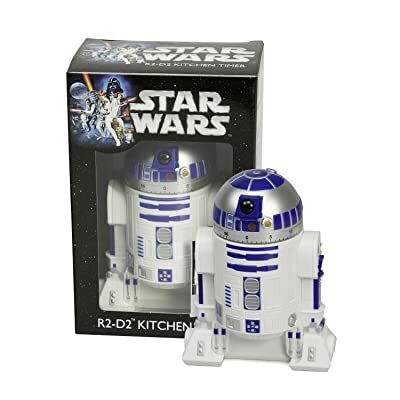 If you’re here at Cook’s Measure, I’d bet you’re either a cook looking for a cool kitchen timer or shopping for a gift for a Star Wars R2-D2 fan. And this guy is much more fun than your average kitchen timer. You rotate his head to set the time you want, and then his head rotates around until he signals the done deal. How can an R2 lover not fall in love with that? Amazon can even gift wrap it for you for the person you’re giving it to. Of course, wink, wink, we wouldn’t say anything if you buy one for yourself, too. I also like the fact that this is a licensed Star Wars product, so you know it will not be a piece of knock-off junk when you get it home. If these are out of stock at Amazon, you can also try ThinkGeek to see if they have the R2 Timer in stock. Who is your favorite droid?